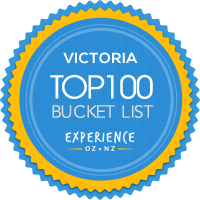 An easy 700 metre walk takes you to an awe-inspiring view of one of Victoria’s highest waterfalls. Plummeting 84 metres the falls have been a favourite since the 1860’s. To get there drive to Steavenson Falls carpark, which is located 3km along bitumen on Falls Road. Alternatively take the Tree Fern Gully Trail, a scenic 3.4 one way walk from the heart of town to the base of Steavenson Falls. Further information about Steavenson Falls and the other walking trails in Marysville and Surrounds are available from the Visitor Information Centre, so call in and pick up a map.